Last month I wrote about how rod licence money helps to protect and improve fisheries. Since then, I have been talking with Simon Ward, one of our local fisheries specialists, to find out about our work in the Midlands. Our top priority is responding quickly to fish in distress. Simon gave me a recent example where a fast response made a big difference. Simon explained that tackling illegal fishing is another priority such as our ‘Operation Stone’ which recently targeted illegal fishing hotspots. Our officers challenged people fishing illegally on the River Severn, arresting two of them. With the help of BBC Midlands Today we promoted the work with our simple but direct message if you catch fish illegally, we will catch you! Healthy fisheries depend on healthy fish stocks, which is why we are removing or bypassing barriers to river fish migration. We are currently building Whatstandwell fish pass. When completed fish will be able to migrate around a weir, opening up more of the River Derwent for spawning, feeding and refuge, improving stocks for anglers. Fish stocking plays an important role in restoring fisheries. Our fisheries teams work hard to use fish stocks to help restore natural populations. Grayling, for example, are absent from the upper River Ecclesbourne because of a significant barrier to migration. Our local fisheries teams have are now working closely with Derbyshire County Angling Club to correct this. We have currently stocked 400 young grayling from our Calverton Fish Farm above the weir to help restore the population to its former glory. And it's not just the fish who are benefiting! Things are improving for anglers too! 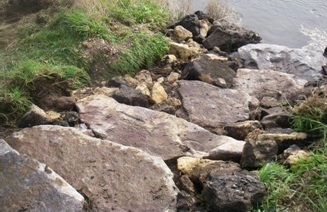 On the River Trent, we have built 30 long lasting, sturdy flat stone angling pegs on two club stretches. 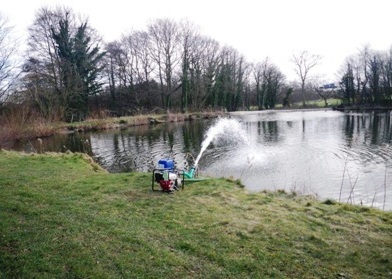 The Teme near Ludlow is benefiting, not only because fishing there is free, but from the three all-access fishing platforms and improved the paths for anglers that have been completed. If you're planning to go fishing make sure you have a valid rod licence, you can purchase one here, and remember under 12s can fish for free! Paul Lidgett is a Senior Fisheries Adviser at our Head Office in Bristol. Immigrants are fishing for food.I saw 5 of them on the Sheffield canal just rods and bait.What is being done about that?. Immigrants are taking the Bream and Carp from our leisure fishery ponds for food, they are also taking the ducks from the canal, so its about time the Agency hired some heavies to patrol our lakes and waterways at night. Or is that against the poachers human rights? Could we get some more fish in Riverlin pond? I'm not sure how many are in there for float fishing but I've been about 6-7 times this year and not caught anything there even though i went loads last year and always caught something. The Sankey / St Helens canal in Sankey valley park, south of the A57 is totally overgrown with Reeds & Lilly's, The reeds stretching from bank to bank in places and the lilly's covering everything else. This area used to be well used by local anglers but is now totally un-fishable during the summer months. The present conditions are surely not ideal for fish stocks, although the stretch does hold a good head of fish. Who can be contacted with regards to having this stretch cleared of excessive reeds, weeds & lilly's? There are always immigrants fishing the pools and canals that are local to me (the fens pool nature reserve,Dudley) the fish stocks have declined dramatically. I used to go to these pools when I was a child and we were able to catch pike after pike but if we go over there now were lucky to catch anything at all. Something really needs to be done about this because its ruining it for everyone. It seems every report is side stepped all we anglers hear is hot air and lies i am under the opinion that all the people that should do something just talk come on EA live up to your name and start action. I am a trout angler and have forgotten what a decent Tyne trout looks like but i am informed the river is in top condition by the EA i have fished this river for nearly sixty years and i know the fish stocks are dangerously low. Can you tell me what action i get to save the stocks in the main river? The Fisheries and Biodiversity Team within the North East have taken a look at your comments and provided the following information. Anglers have made comments to the EA that there is a demise of brown trout. In light of this we have been undertaking some angler catch studies. These studies have given results showing that the Tyne brown trout stocks seem healthy. We know there are plenty of trout in the Tyne (both juveniles in our fisheries surveys) and adult trout as demonstrated on the 17th August. Hi mate. I live near grapes pool, how come furnace were netting the fish do you know ???? On two of the rivers I fish - The Dee in Farndon Cheshire, and the Dane near Holmes Chapel (Cheshire), have very few places where its safe to fish. What are the guidelines/policies around clubs creating safer pegs to fish from please? The River Dane is a small river, and suffers from rapid rises in water levels, it's also plagued by mature trees that have been blown down by the gales over the last few months, that lie in and across the water. What is the process for clubs to request help and assistance in getting these trees moved?